There’s a petition on Change.org that proposes for Nintendo to translate the recently-announced Majora’s Mask 3D into Russian, so that more fans all over the world will be able to appreciate the game. The petition asks for 500 signatures, and currently (at time of writing) holds only 228; they’re going to need a lot more people for this to be considered by Nintendo. Nintendo could very well profit over this decision, as the country of Russia is the ninth most highly populated on Earth, and a simple translation effort could result in tons more copies sold. Over the past few years, Nintendo has translated a variety of Mario games into Russian, but as far as Zelda goes, the only actual localization efforts made to these regions have been limited to cover art and instructional manuals. On November 6th, 2014, Nintendo announced The Legend of Zelda: Majora’s Mask 3D, a remake of original 2000 game from Nintendo 64 to Nintendo 3DS. This is a third mainline game in The Legend of Zelda series since Nintendo started to fully localize their products for Russian customers, but the fate of Majora’s Mask 3D’s translation is still uncertain. Nintendo of Europe localization team is making Russian translations of Super Mario games and games connected with this franchise. However, the second most important Nintendo franchise is limited in its localization to instruction manuals and covers for seven years (since The Legend of Zelda: Phantom Hourglass, made in 2007). As a result, a lot of Russian gamers cannot fully experience one of the most adventurous and epic game series. 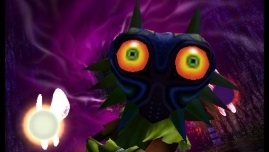 Majora’s Mask, the game being remade for the modern game console, shows the essence of the series in a biggest way possible, thanks to its atmosphere and interesting gameplay features. By translating this game to Russian, Nintendo will make fan base of the series with over 80 million games sold grow, attracting people who couldn’t make their way earlier due to the language barrier. By signing this petition, we ask Nintendo of Europe to translate (and Nintendo of Russia to contribute to the process) the upcoming The Legend of Zelda: Majora’s Mask 3D as a greeting to both existing Russian fans of the franchise and the people who are going to dive in the world of Zelda games. Sign the petition here; it’s only a few minutes of your time, and it could actually go a long way to make the series playable for millions.